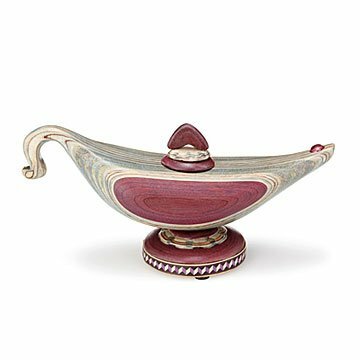 This handcrafted lamp is a magically beautiful design (genie not included). Fame, fortune, true love—if we could guarantee any of these things by selling lamps, we'd have a foolproof business model. It doesn't come with a wish-granting genie, but Robert Hargrave's handcrafted lamp is a magically beautiful design. He starts by laminating warm mahogany, naturally vivid purpleheart, and other hardwoods to form an organic layer cake of contrasting colors and grains. Next, he hand carves a classic, Aladdin-worthy lamp from the laminate, complete with lid and a mysterious interior chamber to hold small keepsakes. This finely crafted sculpture is a sure-fire conversation starter. Handmade in Portland, Oregon. We asked Robert what he thought a kindergartner would say if faced with his work. His answer? "Awesome." Read more on our blog. "In a homogenous world of sameness, diversity is something to strive for," says Robert Hargrave. "My goal is to make products that are a joy to look at, a pleasure to touch, and an honor to own." As a child of the Sixties, Robert chose the road less traveled. While an art student at the University of Florida, he began laminating and carving plywood, which was readily available and encouraged by his professors. After graduation, he made his way to Boston to live the life of an artist. His first experience selling his creations was through a Christmas shop in Cambridge. As his business continued to grow, he moved to upstate New York, exhibiting in craft fairs all over the northeast. Eventually, he found his way back to Florida and settled into an artistic community. After four decades of working with his hands, he still finds it challenging to create well-crafted pieces that will be treasured.